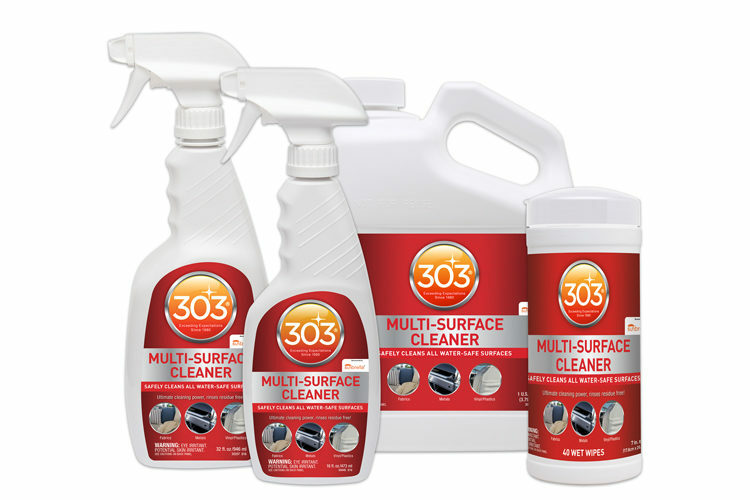 What is 303® Multi-Surface Cleaner™? 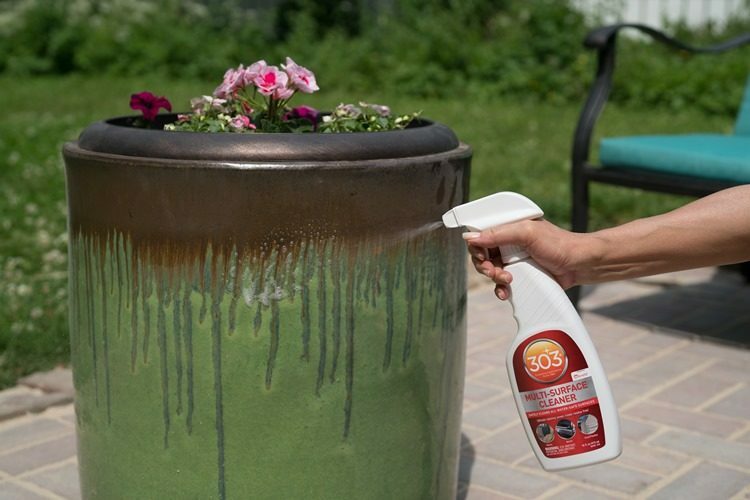 303® Multi-Surface Cleaner is rated 4.7 out of 5 by 141. Rated 5 out of 5 by Chaparral 260 from Super product with many uses As soon as I brought this home my wife asked me if it would help remove the fingerprints on our stainless refrigerator doors, holy cow! We could not believe it removed all the grandkids finger prints and looks beautiful. I have used it on the galley and bathroom on our boat and everything shines. The sinks and countertops have never been so clean and bright. Rated 5 out of 5 by mikec from Great Product Used this product for general cleanup instead of my usual Simple Green. Seemed to work as well or better than SG. Have used on a variety of hard surfaces in the shop/garage/garden shed with great results. Have also used on stains on floor mats with great results. Important to follow instructions on label. This product is a very good all-purpose cleaner. Rated 5 out of 5 by Motor head from Superior cleaning action One of the best cleaning products I have used in a long time, Does a superior job cleaning vinyl siding of bug and bird droppings and stains no scrubbing just spray on hose off. Cleaned brake dust off tires and rims again spray on hose off could not be easier or quicker. B-B-Q grill looks like new after a little scrubbing with a brush. Rated 5 out of 5 by R055 from Great to have with you for small stains/issues Great to use as a cleaner for cleaning anything other than extreme stains or mildew/mold. Use a scrub brush with this for dirty things that have been sitting long! Rated 5 out of 5 by blue1s from Awesome cleaner I used this on my recliner that has maybe a suede type material. It had lots of dirt and grime on the arms where my dirty arms got it dirty. I tried 1 or 2 other furniture cleaners but nothing worked. 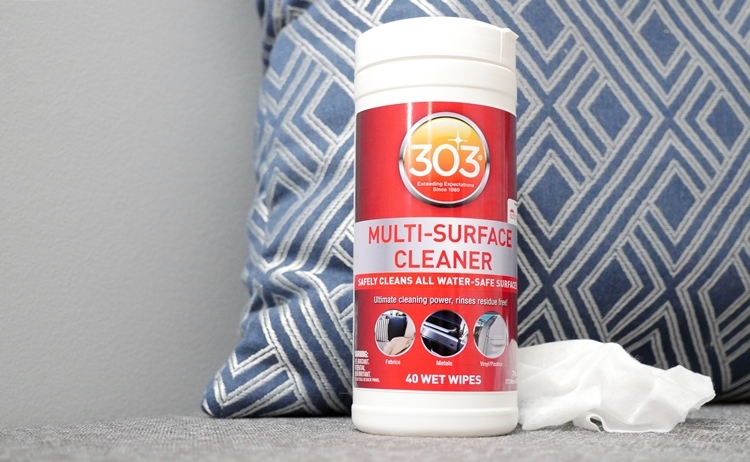 The 303 Multi Surface cleaner got it clean! I had to scrub it a little but this stuff really did an awesome job of getting my recliner clean! 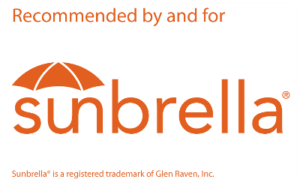 Rated 5 out of 5 by Autobroker from I used this to remove some stains on my 2 sunbrella runner rugs in the entryway ^ Laundry room. Sprayed it on & used an old toothbrush to scrub the spots. Very easy, the results were instant. Good product to buy & have on hand when you want results for removing those unwanted spots that just seem to show up. Rated 5 out of 5 by Mark58 from Cleaned the various materials on my boat I have an aluminum boat with decals and an outboard. The boat and motor were getting a bathtub ring around the outside from the waterlines at the lake. I applied the cleaner to the many surfaces and it cleaned them all. The aluminum, the decals and the painted steel on the motor all cleaned nicely. Rated 4 out of 5 by NEDiver from Pretty good cleaner 303 Multi-Surface Cleaner works pretty well. I tried it on the toughest cleaning problem that I have to deal with on a regular basis, grey streaks on my RV. It worked better than most multi-surface cleaners. I also used it on some of the plastic interior pieces in my truck and it worked very well. Rated 5 out of 5 by Ladano1957 from Great Value I have used this both on my cars & around the shop. Works great on getting grime and brake dust on the wheels. 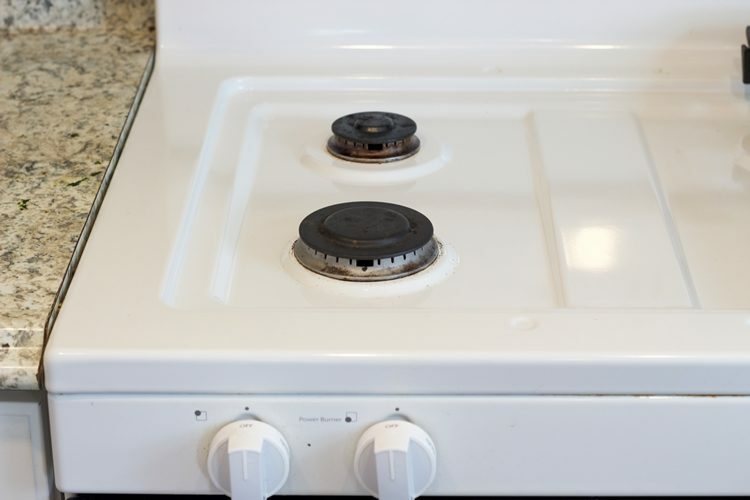 Makes cleaning small spills a breeze. Rated 5 out of 5 by Bobsch from Works great This stuff works great both on the boat and around the house. Does a great job on everything but glass. Rated 4 out of 5 by GLOCKer from Used it to clean up my riding mower! I was sent this product to T&E from Gold Eagle, and as soon as I received it, I figured I had the perfect use for it. I like to keep my riding mower in a very clean condition in the hopes that I can get it to last for a long while. Unfortunately, due to a lack of time and the hot weather this summer, I had been neglectful of my mower cleaning duties! I set to work with the Multi Surface Cleaner this past weekend and I was happy with it. It cut through some pretty nasty built up grime on my mower deck. The only reason I didn't give it a perfect score of five stars was because on the plastic cowl, it didn't feel like it lubricated the surface and I could feel the microfiber clothe I was using dragging on the surface. It's probably a pretty minor complaint but I'm serious about detailing my car, so it stuck out to me. Rated 4 out of 5 by Papa from So far So good I like to do a little horse trading for old cars, trucks and most anything that doesn't eat, and I've used this product to do quite a bit of cleaning of lots of different surfaces. It's not chemically strong enough for something extremely gunked up and nasty, but it's not the kind of product that I would place that kind of expectation on. It's done a great job on everything that I've used it on so far. Rated 4 out of 5 by tbirk from Works as advertised I used this product to clean some dirt, droppings and oil off my classic truck and it worked well in removing all of these. In the case of the most stubborn dirt, it needed several applications. I didn't note any streaks after cleaning with a microfiber towel. Note: The bottle was leaking through the packaging when I received the product. I will continue to use this on all of my vehicles. Thank you! Rated 5 out of 5 by racerrandy from Works Well On All Surfaces I tried 303 Indoor & Outdoor Multi Surface Cleaner on my vehicle, right after I ran it through the car wash. There was dirt that the car wash just couldn't remove. Lightly spayed 303 on the surface, waited a few seconds for it to "do it's thing" then wiped the surface with a clean, microfiber towel. The surface was squeaky clean! Maybe my local car wash should invest in some 303 too. Rated 5 out of 5 by 65Corvette from Highly recommended I learned of this product from the Mastercraft Boat instructions on cleaning and care. 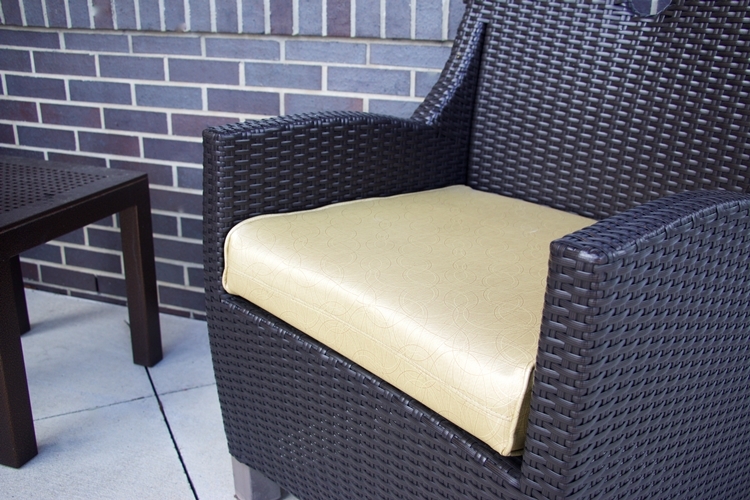 I have used it on the vinyl seats and upholstery, and fiberglass, and it works fast and easy and will not harm the materials. It also works well on canvas and cloth. Thank you for a great product which I now keep in the boat, on the dock and in my garages. Rated 5 out of 5 by mechanic from Removes stains from car seats. I used this product on my wife's 2006 Equinox front seats. They were stained real bad and my carpet shampoo didn't completely remove the stains, which were from spilled Pepsi! I used the multi-surface cleaner, using the directions on the bottle, and the stains were completely gone after the cleaned area dried. Real impressive. Rated 5 out of 5 by Sloater from Great indoor cleaner When I received this product I was a little skeptical about an outdoor and indoor cleaner in one bottle. 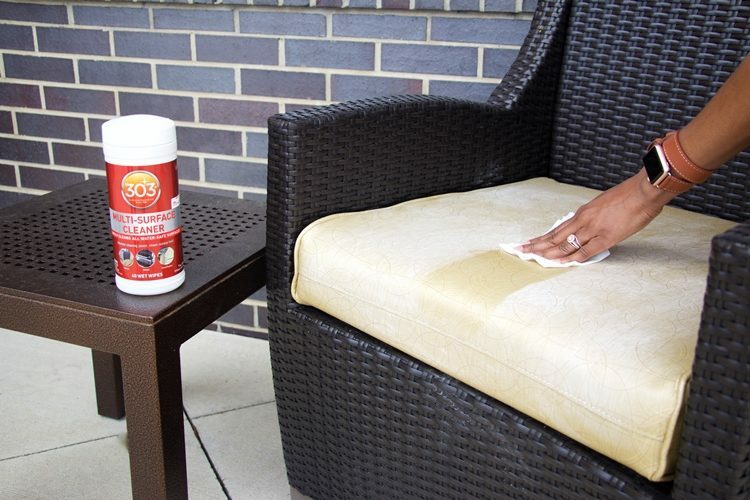 I used it on the outdoor table and chairs and it did an excellent job of cleaning my aluminum patio set. Then I gave it the indoor challenge and used in on the countertops and wow! No residue and very clean. Awesome!! Rated 5 out of 5 by Stymies from Excellent cleaner, work as expected I used this cleaner for the roof of my screen house before installing it for the season. There were a couple spots on the roof from last year that I couldn't get off from sap and dirt. I sprayed the cleaner and let it sit for about 10 minutes. I was able to get 95% of the stains off of the roof and it looks great. Rated 5 out of 5 by SoCalSteve from Great Product! 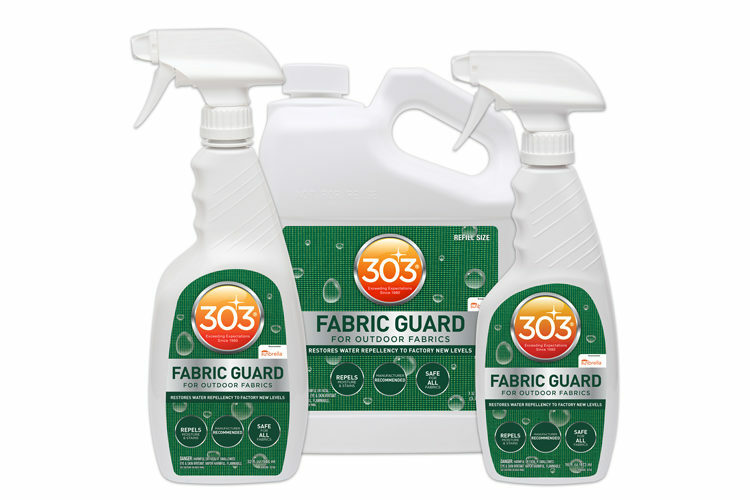 We used 303 Indoor & Outdoor Multi-Surface Cleaner to attack a set of patio furniture that hadn't been detailed in nearly a year, with excellent results - 303 was easy and quick to use and did a great job of renewing these items. We'll surely find more uses for this product. Highly recommended! Rated 5 out of 5 by Craig from Handy and quick! If you have ever had to look for a cloth and then the cleaner then you will appreciate going to one place for it all. Very convenient and works very well. Seemed to be safe on everything I used it on though handy to have a dry or damp cloth to wipe up and residue on hard surfaces. 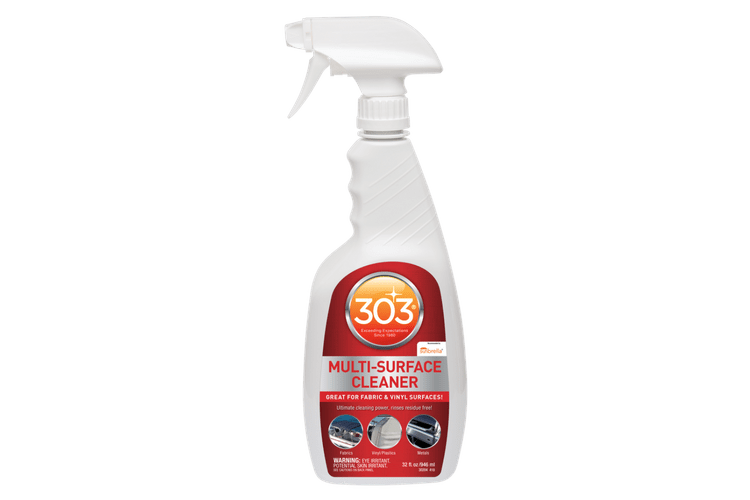 Rated 4 out of 5 by Turner0923 from Multi-surface cleaner I recently tried the 303 indoor-outdoor multi surface cleaner doing some aptio clean up. I found the product worked as well as my previous cleaner simple green. No residue clean finish and easy to use. i would recommend this product to anyone needing a good multi purpose cleaner. 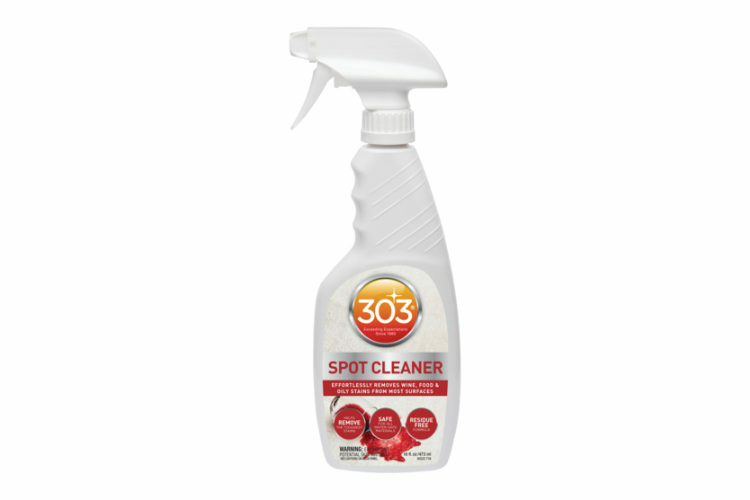 Rated 5 out of 5 by nineback from Excellent Cleaner I got the product ot use in the garage on my motorcycle, Rv and car. I also use the spray bottle of this product. I found the wipes to be as good as the liquid and easier to use. My wife also tried them in the bathroom and found the wipes do an excellent job in there as well. Rated 4 out of 5 by karsen418 from Easy to use and convenient These wipes worked great for most thing I cleaned. 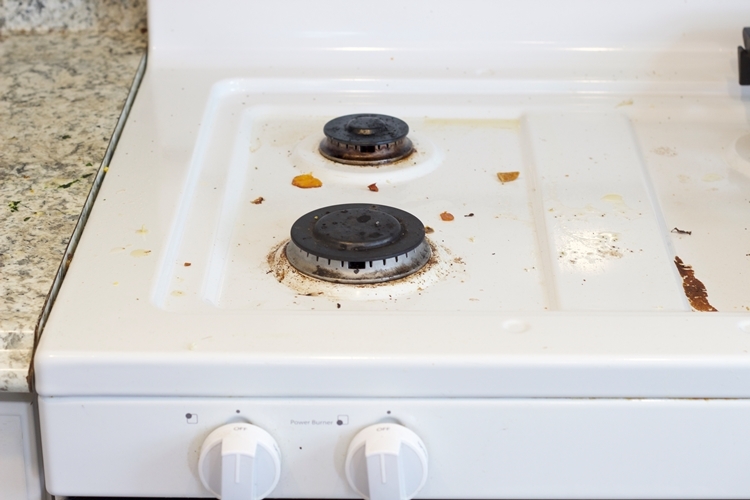 The only thing they did not do well is stainless steel on our kitchen appliances. They did clean the fingerprints but let some streaks but on the other hand stainless stell appliances are not the easiest to clean streak free. Rated 5 out of 5 by Hate Work from It seems like 303 Aerospace cleaner with the towel I have used the 303 Aerospace cleaner for years. This product goes on like it. 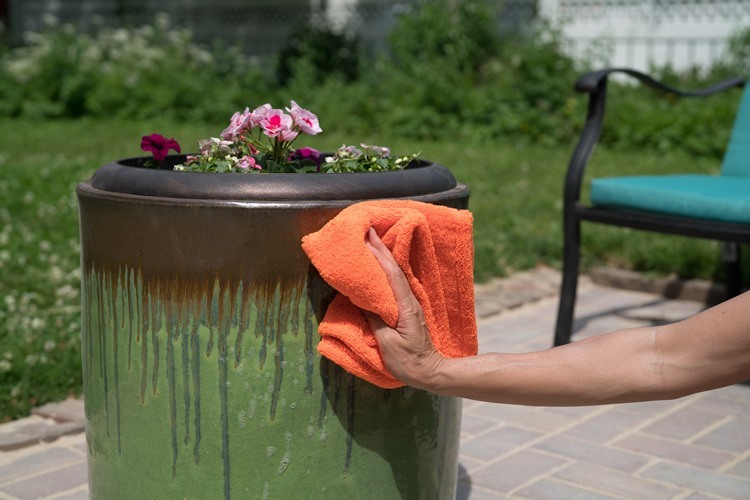 It cleans well, but you need to use extra elbow grease to get a nice, slime free look. These will be targeted for tougher jobs and I'll continue the use the speed detailer spray for smaller jobs. Rated 5 out of 5 by GiGi from Works great! 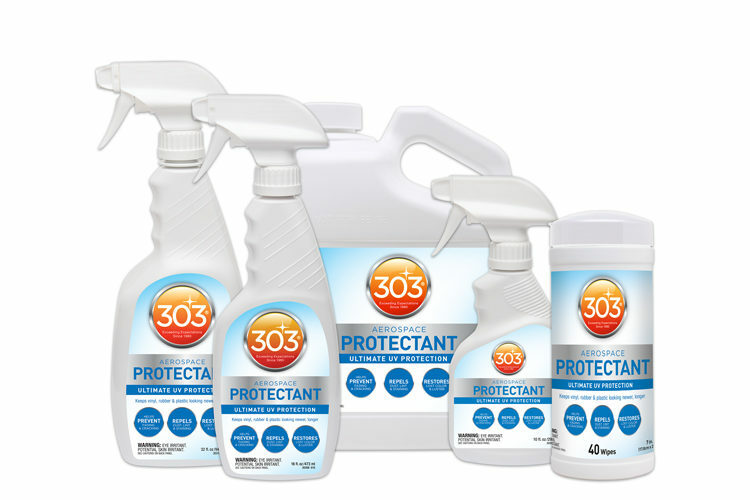 I have used many other 303 products before and I am always please with how they work. The multi-surface cleaner didn't disappoint. We used it on our boat and in the kitchen. Worked great in both places. It cleans well but also leaves the surface looking nice. Rated 5 out of 5 by 8barrel from Gets The Job Done! I used the product on white color Trex outside table and chairs. My wife had cleaned them just prior to inside winter storage but they did not appear as bright as they were when new. This product brought back the whiteness and does not leave a film or residue. 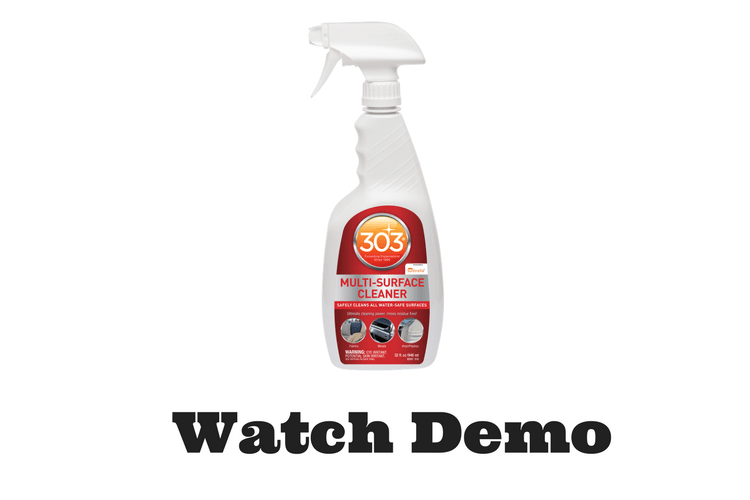 Rated 5 out of 5 by richard from one tough cleaner After purchasing the 303 cleaner & first using it on my truck to clean several years of grime. I'm impressed! It dissolved almost all the grease, grime & dirt that had accumulated over years, the interior of my truck looked almost new! I like this stuff!! Rated 5 out of 5 by lefty from best interior cleaner this has to be the best cleaner for car interiors. I have a black interior, so dirt shows really easily. I just spray the 303 Multi-Surface Cleaner on my dash, trim and leather seats; wipe it off and the results are outstanding. No glossy glare either.